Since it is the Christmas Season, I am going to take a little break from my Missouri Vacation Posts and share some Holiday Season Travel Posts. 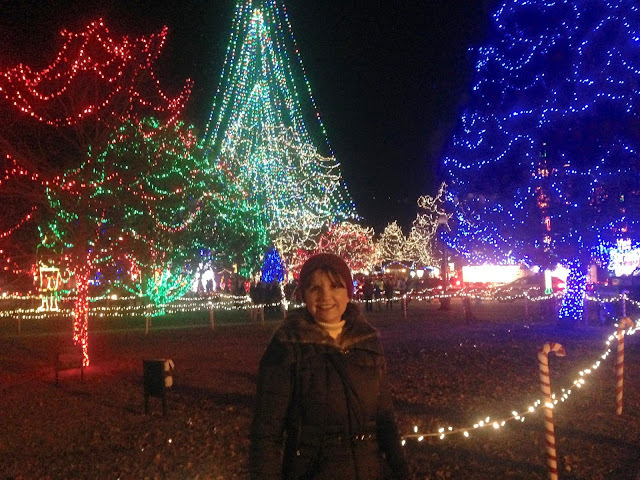 This past weekend my husband and I went to LaCrosse Wisconsin to see the Rotary Lights. We have lived in this area for over 25 years, and would you believe we had never done this before? Why, you may ask? I never knew it was there...but apparently this is a 22 year old tradition of LaCrosse! I was made aware of this wonderful holiday event by a friend's Facebook post. My husband was not to thrilled about driving an hour and a half on back country roads in the dark (we have a large deer population in our area and car/deer collisions are a common occurrence). So we took the oldest, most beat-up car we own (cause what difference would one more dent make if a deer collided with it?) and after I packed it full with blankets and food in case we got stranded overnight off we went! You can drive through the park to see the lights (but be prepared to wait in a very long line) or you can walk through. They also have carriage rides available (which was another long line). It was a mild winter evening for Wisconsin, around 32 degrees, so we chose to walk. And I'm so glad we did, because I think you get so much more out of it walking through it verses driving. 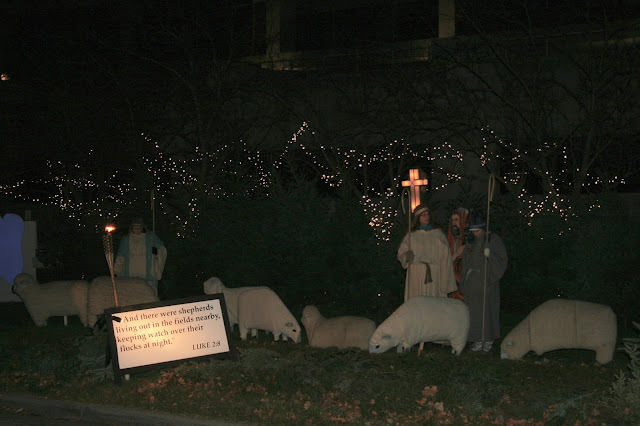 They have a living nativity which my husband and I were very pleased to see. They had several scenes of the Birth of Christ story, marked by scripture. 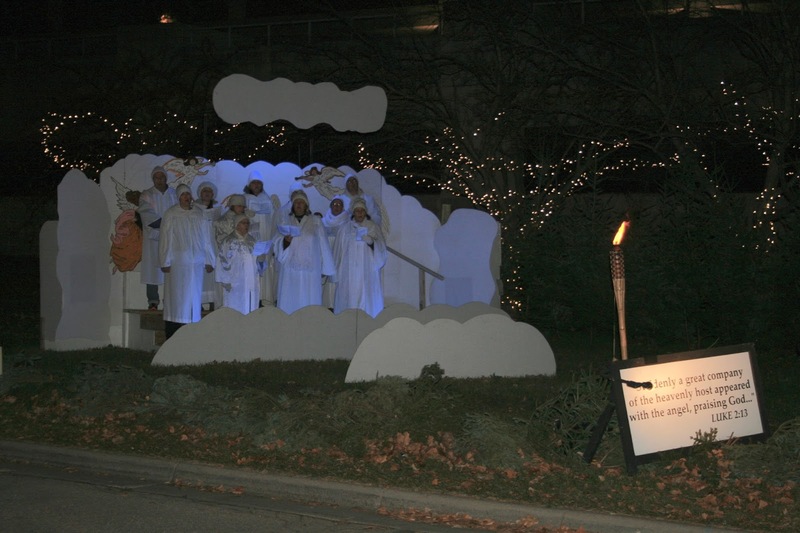 The angelic choir was actually singing, and they were pretty good! More than 400,000 lights illuminate LaCrosse's Riverside Park. 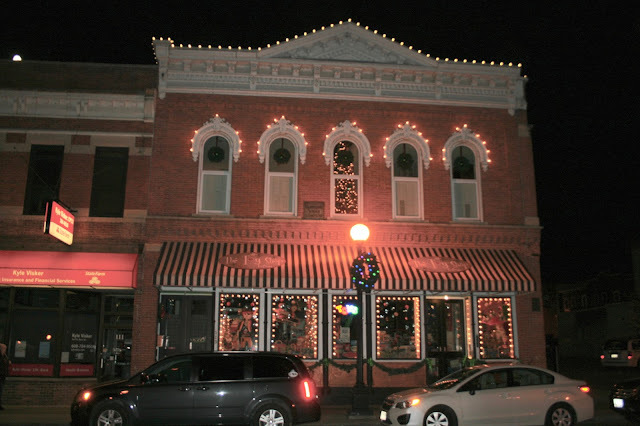 They also have a 140 foot illuminated Christmas Tree and animated lighted displays. Frosty the Snowman was always one of my favorite animated holiday t.v. shows, so I was super excited to see him here! They had multiple ways of keeping people warm on frosty nights. They had two warming shelters. We stopped in this one, which was a lighted igloo. I couldn't believe how warm it was inside. They also had a wood camp fire and plenty of hot chocolate, cappuccino, coffee, and tea for only $1.00. It was such a beautiful, romantic evening. It's so rare when we can just walk outside in Wisconsin and not want to run back inside as quickly as we can because it's too cold to bear. The weather was perfect for such a night as this, and judging by the crowd of people that were there, others agreed. This eagle sculpture is always at the park (eagles are a common sighting in this area). They put a circle of carolers around it. And here is the 140 foot illuminated Christmas Tree I told you about earlier. This was truly breathtaking to behold; especially when I got under it and looked up! Of course, everyone around here is a Green Bay Packer fan so we had to have a lit up Packer player as well! I love the nutcrackers and Rotary Lights sign with the tree in the distance as you enter the park. Santa and his reindeer are at the park too! You can see Santa every night from 5 to 8 pm until December 23rd; after that, Santa is busy! This is Santa's Elf House. I already have everything I could ever want, so I didn't stop in to see Santa today. He looked like he had a very long line of children who wanted to talk to him. Even though it was warm for a Wisconsin evening, I dressed very warm in a long down-filled parka, beanie, gloves, and boots. They had the cutest area set up where you could take photographs on Santa's sleigh, with his reindeer, or in winter scenes. This stuffed reindeer was just too cute! I love these vintage snowmen! Aren't these wooden Victorian carolers lovely? As if there wasn't enough to do for the kids, they also had "train" rides and free family hay rides! After we walked through the park, we blissfully headed back to our car. We had never been to downtown LaCrosse before, and I was stunned by the beautiful architecture. This is a toy store all decked out for Christmas. I love the wreaths in all the upper story windows and the window displays. This candy/ice cream store was packed! We laughed that they had so many customers on a cold winter evening. I thought downtown LaCrosse was so beautiful I said to my husband that we must go back in the summer or fall to explore more! And the best part of the three hour drive there and back? We got to look at the GORGEOUS super moon! Did you get to see it where you live? LaCrosse's Rotary Lights is open 5 to 10 pm daily except for Christmas Eve and Christmas Day (5 to 9 those days) and New Years Eve they are open 1:00. The Rotary Lights display opens the day after Thanksgiving with a parade! There is no cost to walk or drive through the park, but they do ask for a cash or food donation. I looked in my kitchen pantry for canned goods, but would you believe everything I had was expired? haha! I guess I'm a fresh or frozen kind of gal, so we gave them cash instead! Thanks Mica! It definitely was worth the drive! This looks so pretty and I love that they offer cocoa and coffee. Only Gluehwein is missing (a sort of hot spiced wine they sell at Christmas markets in Germany). My daughter's best friend from preschool moved to LaCrosse years ago, we were going to visit them but sadly never did and we have lost touch with their family unfortunately. It looks like a really pretty city! Thanks Elli, I've never heard of that drink before. How interesting. I always see pictures of European Christmas markets and would love to go to one someday. That's sad about your daughters friend. Did you check FB to see if they are on there? That's how I found a lot of long lost friends. What a cool place. So beautiful. Love it. Thanks for sharing. Amy, this looks like it was absolutely a wonderful experience. 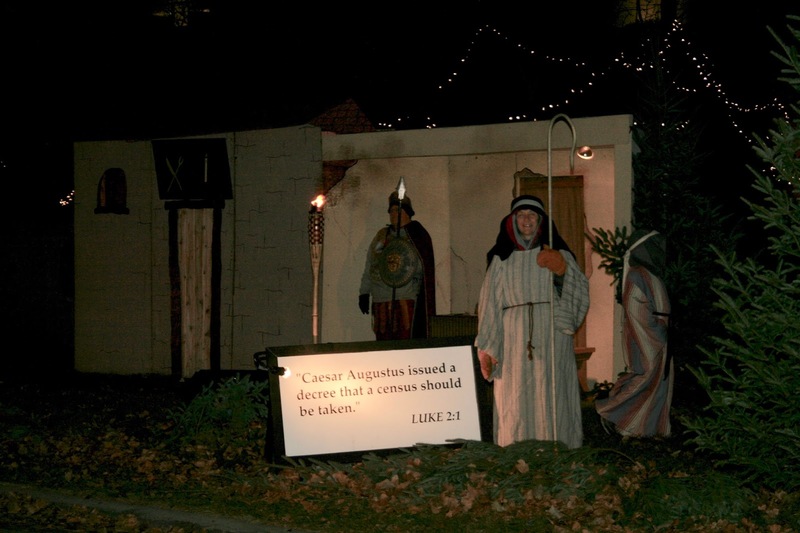 I love the living nativity too. It was Carrie! We need to take time out from the busy stuff of Christmas and do things like this more often. 32 is mild?! You can tell I'm a cold weather wimp, when it's 32 here I hide indoors! But these lights are beautiful and worth a little walk in the cold. Glad you enjoyed it Amy! haha! Yes Brooke, anytime it's in the thirties or forties in Wisconsin we break out the flip flops! That is mild for us. Most people don't even wear a winter coat when it's that warm. You should come here now...we had a cold front move in and were freezing! It's only 11 degrees as I write this! Yikes! But it can get far, far colder than that too...double digits below zero. Thanks Carrie! I've actually lost count of how many deer we've hit over the years! I wonder if your botanical gardens or zoo has a light display? 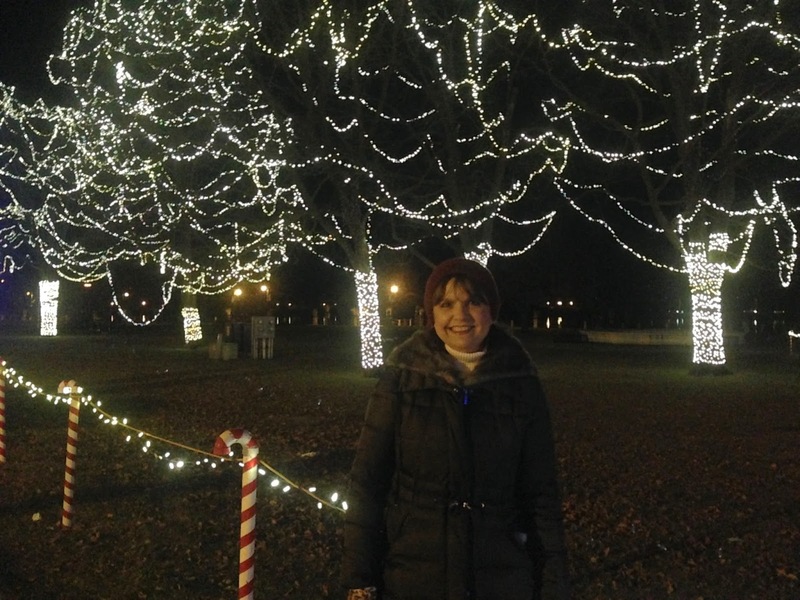 Thanks so much for sharing your pictures of the Christmas light display! It makes me want to go there! I think it would have been fun to hear the choir, too! I'm glad that the weather was warm for you. And, now, you've made me want to LaCrosse -- but I definitely will visit it when the weather is warm! Thanks for participating in our Party in Your PJs link party! Thanks so much! We hope to go back this summer/fall and explore more ourselves!